Age has made me appreciate my father more. As a kid we clashed a lot. I'd avoid my father like the plague because any little thing I did seemed set him off. Hell, to this day I'm pretty sure given the opportunity I still wouldn't decorate the Christmas tree with him. And I almost never, EVER load the dishwasher when I visit them. It wasn't until I got older that I appreciated how similar we were and how relaxed our relationship is. Who cant love having a dad whose shoulder you could cry on if you wanted? Or you can have a beer and swap racy jokes with? And I appreciate that when I complain about something, or ask for advice my dad will actually tell me I'm wrong or plays devils advocate. So my dad doesn't tell me what to do and fuss over me like a child, and I don't avoid him to skirt around the parental nagging it seems some of my friends are subjected to still, into their late 20's. He respects my independence. Hell, he encouraged it. So even when he doesn't agree with things that I'm doing, or ways that I'm living, my dad is awesome enough to respect that I'm different than him and as long as I'm happy, he's happy. 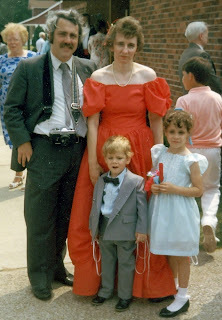 Here's a shot from '87 of the family at a friend's wedding; my dad still had darker hair and was sporting his awesome 35mm SLR. Very nice comments about your dad. So sorry it's taken me this long to get around to reading them. But your dad didn't miss it. Love Mom. 221/365 - Birthday Celebrations and Tasty Cake!